Last week, I had the opportunity to see Rift's new expansion first hand with a guided tour by former WAR Community Manager, James Nichols. It's no secret that Rift isn't my game of choice, but as a MMO fan I've been following it for quite a while and played during beta and launch. Is Storm Legion enough to get me back into the game? First, let's start with a montage of some of what I saw. I think every morning should start like this actually. PvP. One of my first questions was about PvP, of course. Trion will be including a new warfront in the expansion, called Karthan ridge. Karthan Ridge – Opposing sides must run empyrean bombs into their enemies base and detonate them at designated Power Sinks. We’ll be testing this mode out in Open BETA this weekend and make adjustments or try out other formats depending on the feedback we get. Blowing stuff up does appeal to my inner Dwarf. Carnage Missions. The full fruition of Kill 10 X quests without having to actually pick up the quest. Kill something and the quest will just start. I expect this to lead to the mass slaughter of creatures on these new continents. Dimensions. Rift will be including player housi.... err zones in Storm Legion. Full free form placement for a zone instead of just a house. I saw some amazing creations and that was just beta stuff. Crafters will get to build items to decorate these new areas. You can even add some NPC's to your area. On the downside, there does not appear to be much in the way of functional items. So no true vendors, auction house guys or banks it seems. For someone as anti-social as me that is a bit disappointing. I can understand why Trion would not want to go that route though, as it might empty out their social areas. Crafting. No new professions, but a new tier of crafting will be added with new recipes. Visuals. I was very impressed with the visuals of Storm Legion. Thew new areas and raid zones looked fantastic. As did the creatures, and especially the bosses. This was on my 5 year old box too, so I suspect it might look better for a large chunk of you with newer systems. Mechs. As you can see in the video, one of the new dungeons ( Storm Breaker Protocol ) allows you to control a Mech ( think Play as Monster WAR fans ), who has rocket launchers. Rocket launchers. New Souls. There are 4 new souls in the expansion, during my tour I chose the Tactician. He has a big gun and shoots fire and ice, how could I not? He seemed pretty fun in my brief time playing him. To answer the question I posed at the start of this post, yes I will play Rift: Storm Legion. I love new expansions, and there is a lot about Rift I want to check out. Instant Adventure, Conquest PvP, 2 huge landmasses, Dimensions and more. How long will it hold me? We shall see. Intrepid developer Keaven freeman took to the forums and laid out their plans for unifying all of Warhammer Online's RvR currency into a single version called a War Crest. There are at least 25 different RvR currencies, so unifying them seems like a great improvement. On to the details! There will be money changer vendors to help convert any old currency you have into War Crests. There will, of course, be a conversation ratio you will have to keep in mind. Before I list those ratios, let me first give a little background on how we came up with them. He's got some nice charts showing the changes as well. I'll leave those on the thread. There is a big BUT with all of this. The vendor pricing is being increased, in some cases by 5x. Players were obviously concerned. Keaven did start to address them in reply. The goal for this was not to make it more difficult to get things, but to make the system less confusing. The vendor adjustments represent the intrinsic value of the old coin, in terms of difficulty in acquiring it. Since the new War Crest would be given out everywhere, it would have been irresponsible not to adjust the vendor prices to accommodate that new fact. I can certainly understand why some players would be against the 5x price increase. If they spend their spare currency on things like potions it seems just like a flat out price increase since they only have the currency they need saved up. On the other hand, a player like myself has a lot of lower level currency stored up and the price increase is not a big deal. There is a middle ground here somewhere, as overall a single currency is a great change. It just shouldn't punish players who spend their tokens as they get them. RvR currency given out as rewards will be swapped to the new War Crest. Currency drops off player kills will be scaled by your Tier – at least, this is the leading suggestion at this time. Keep in mind, you still need to win the loot roll in order to claim the dropped War Crest. Also, these numbers are just a starting point for conversation. I’m interested in hearing how you all feel about these figures, and what suggestions you may have. I'm still pretty excited about this change. Moving to a single currency makes things so much simpler and allows for some interesting additions to the game. BioWare put up a new patch to the PTS last night, so I was compelled to see if anything new was added. For the most part, I saw new vanity pet stuff. Say what you will about the Cartel Store, it won't be short on pets. I also expanded my search and found some other interesting things which may or may not be new to the patch. NOTE: This information may be incomplete, obsolete or just plain not happening. To get started with the Giveaway, just Sign In with the widget on your left and start doing missions. Use the points you gain to buy lottery tickets. On November 5th, the winners of the keys will be drawn. That's all there is to it. On the 5th, I'll add more missions for more chances to get tickets. You could always keep your points for another giveaway too. PvP Poll. What makes a poll be Player vs Player? Only the people who choose the winning option get the reward. In this case, it is a nice piece of loot. Have your allies get in the battle and vote. Loot. I've added Loot to Sites with Benefits! They are technically consumables which will apply a buff to you while visiting the site. For this contest, you'll get a 50% point bonus 1 week. Those who participated in last weeks poll got a token that gives a 25% bonus. To use your loot, go to http://www.siteswithbenefits.com and log in. Then go to the Reader tab and hit Show inventory for weritsblog.com. You should see a use link. It's time for me to quit fooling around in SWTOR. I hereby decree that I, being of sound mind and judgement, will get my Trooper to Level 50.... soon. I've messing around with my Imperial Agent of late, who is awesome, but he'll just have to wait. BioWare has introduced a lot of stuff to do at the level cap, and will be adding even more. What kind of stuff you ask? Daily Mission Zones. I'm not one to grind dailies, but I at least want to check the zones out while they are still relevant. On Corellia, there is The Black Hole. In the 1.5 patch they are adding Section X on Belsalvis. I'd like at least do the missions one time. HK-51. I need a 50 to get this most awesome robot. That's all that really needs to be said. Story Mode Operations. I'm no raider, but I want to see these raids before no one wants to do them anymore. The group finder lets me do it without being overly social, so I actually want to queue it up. BioWare will be adding more of these to the group finder as time goes on, so I better see them while I can get groups. Ranked Warzones. Eventually, I think BioWare will add solo queuing for ranked warzones. I'd like to be able to participate. Makeb. There is an expansion on the way, Makeb, which has a number of entries in the 1.5 patch. I'd like to have at least 1 character ready to see this new world when it comes out. I'm seeing more and more references added, so Makeb will be here before we know it. It's time I make a concerted effort to get those final 8 levels I need. I'll probably just end up doing my class story and queuing up for warzones. I have 2 levels of Legacy perks for each and may purchase the third. As I mentioned yesterday, there is a new Live Event occurring in Warhammer Online. 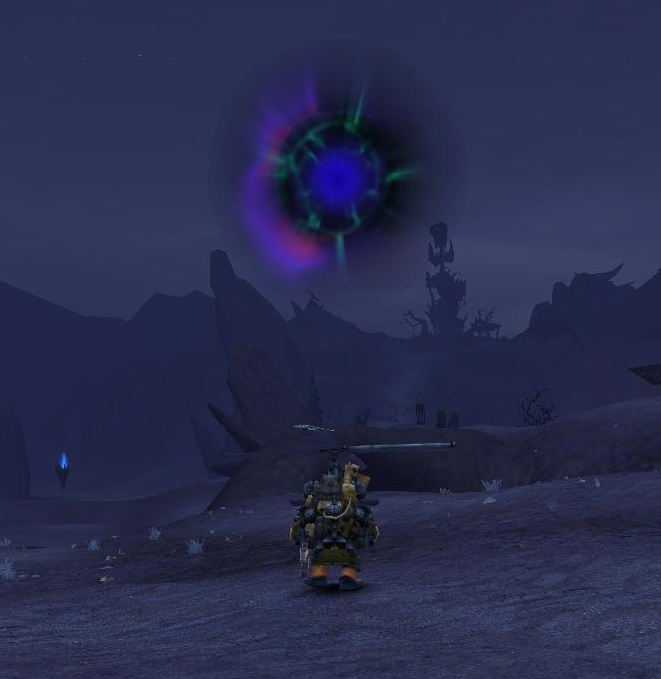 While the fact they are including the Bastion Stairs dungeon is neat, I went strait into the RvR lakes in search of portals, which I found in Chaos Wastes. Destruction players had the same idea, so naturally a fight broke out. I'm not sure if tht is what triggered the Public Quest, but it happened. Daemon spawned, which included regular, Champions and Hero level mobs. The fight went on, Daemons were killed... then the big buy arrived. When you add the enemy to a PvE fight, it suddenly becomes much more interesting. The boss fight uses the kill-o-meter mechanic which I belive takes damage to the both and enemy kills into account when deciding the winner. As Order got there first we ended up winning, but it was a fun fight. The latest Live Event for Warhammer Online just went live! 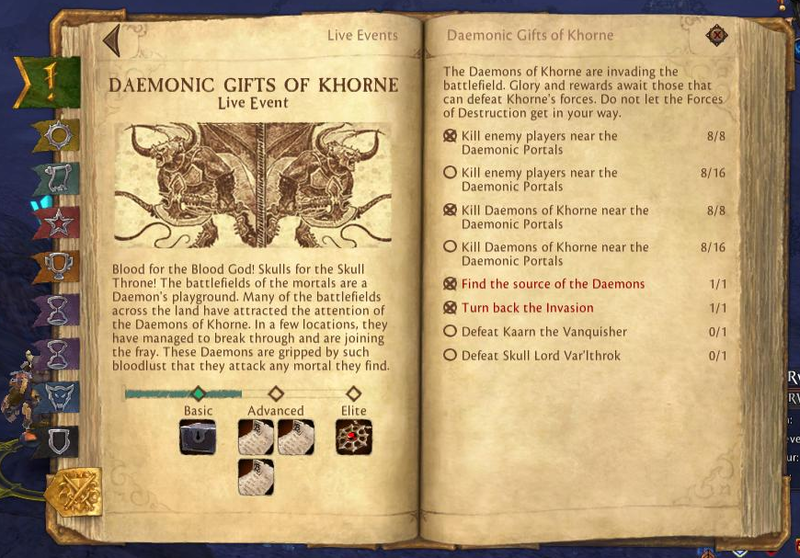 The Daemonic Gifts of Khorne is not your typical event, as it can happen more than just a certain time of year. I'm not sure anyone knows when or what causes it to occur. Here is the stuff from the WAR Journal. What goes on? How long does it Last? No one knows yet. The reward text mentions Chaos Wastes, so it seemed like a good place to start. The Task List expands as you complete tasks. So I may not have to do Bastion Stair in order to finish. abl.itm.vanity_pet.frigate.rep_destroyer - We get a Frigate pet? Sweet, bought. itm.companion.skin.corso.skin.custom_08 - Did they have 8 skins before? Loot. I've also introduced Loot to Sites with Benefits. These rewards are basically consumables which will give you a buff. If you participate in this mission, you'll receive a Token of Appreciation which, when used, gives you 25% more points for one week. I thought it'd be fun to add, guess we'll see. The poll will close Sunday at 12pm EDT. Warhammer Online's 1.4.7 patch hits the live servers today. It's been a while since the last patch, so I am pretty excited about this one. It's got a little bit of everything included. Let's do a recap. 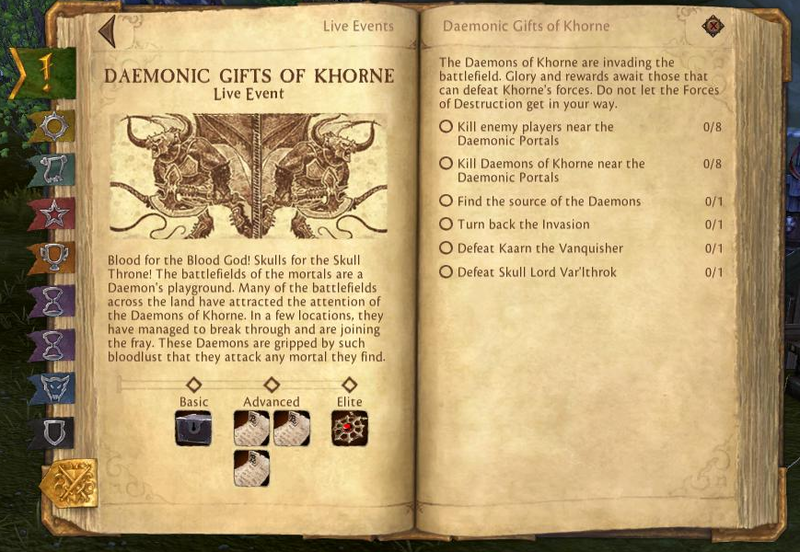 Takers of Skulls, The Horned Ones, Hunters of Blood, Blood Crushers, Drinkers of Blood; the Daemons of Khorne have many names and many forms. Though the legions of Khorne dwell in the Realm of Chaos, occasionally they are able to enter the mortal world where the influence of Chaos is strongest. They fight not for honour, not for wealth, not even for victory – they fight for fighting’s sake, and for the favour of their wrathful lord. Check back for coverage of the new Live Event. As with every patch, the scenario lineup for Warhammer Online changes. I was not a big fan of the last patches list, but it looks like it is about to get a lot better. I'm sure others will disagree though, as it does not contain a 6v6 map. Below is the list for Bracket 3. Nordenwatch. This is a favorite for a lot of people, so I am glad to see it in the list. I give this pick an A.
Khaine's Embrace. Good ol' KE, this is another good one. So popular that SWTOR is using is for Ancient Hypergates. I give this pick a B. Battle for Praag. This is one of my favorite scenarios, and it has not been seen in the later tiers for what seems like forever. Another A here from me. Mourkain Temple. It's not just for Wrath of Heroes :) This is another classic, which was recently revamped (thanks to WoH). I've always enjoyed this map, so I give it an A. Overall I am very happy with the scenarios they chose. It is much improved over what we currently have on live. I know some people want a 6v6 map, but we have had Eternal Citadel for what seems like forever. It'll be nice to not have it being the only pop. Wrath of Heroes is launching a new patch today, which contains a number of new features. This includes a new map: the Garden of Morr. When I was down at the Mythic HQ recently, I was able to check it out. I liked what I saw, and am looking forward to playing it today. Garden of Morr. This is a cross between the Arena and WAR's Mourkain Temple. You gain points by killing your enemies, but there is a bobble you can get which grants more points. It is no ordinary bobble, as it transforms the player into a Skeletal Standard-Bearer who has its own set of abilities. Practice Mode. Now you can mess around with heroes and your builds without playing a real match. Sounds like a neat addition. Rydion. Oh yeah, they are also adding a new hero in this patch, Rydion the Archmage. Another dress wearing Elf, bah! Need more Dwarves. Perk Balancing. The WoH team went through a lot of the perks and made them a bit more balanced. Some, like Power Unbound, are a bit less potent. Others, like Lil' Helper, have had their requirements decreased. This is a pretty important change, as Perks have been controversial.